I love to walk more than I love to bike and since I got this here bike I have really neglected my walking. In fact I have been hardly doing any walking at all and I'm beginning to feel more like a wheeled creature than a human being with legs and feet. PG ( post gym) and PB ( pre-bike) I used to drive to Griffith Park and then walk up to the observatory which is good exercise and very relaxing. Since I have been riding everywhere on a bike now I have stopped walking and hiking as I have been getting plenty of exersise. The other day I took a walk somewhere instead of biking there and noticed how much I enjoyed it and also how strange it felt like I was relearning something I'd forgotten - I kid you not! So I decided to get myself walking and hiking again and to combine biking and hiking. Since there is no bikes allowed on the hiking trails I would need to have a safe place to lock up my bike when I'm hiking and I have solved that problem. Griffith Park is a huge and there are miles and miles of hiking trails and roads to bike on. I like the trails off of Fern Dell Drive directly across from the Trails Cafe. Fern Dell is off of Los Feliz Blvd. in Hollywood where Western Ave. and Los Feliz Blvd connect. Note: Los Feliz Blvd in that area is dangerous for biking stay on the sidewalk if at all possible. Fern Dell Dr. at Los Feliz Blvd. Healthy vegan food, drinks, coffee all prepared on site. Great atmosphere, music, friendly laid back people work there, it's the best kept secret in Hollywood and the place where I park my bike when I go for a hike. When you come back from your hike you've arrived at the perfect spot to relax and get something to drink and eat. They sell doggie biscuits and have free water for dogs and humans. A popular resting place is the Tree Trunk Bench at the Trails Cafe. The owner hired me to build it--have a sit on me. My bike locked to the railing next to the Trails Cafe. Out in the open plenty of people around - not your usual bike theft location and so I feel it is safe. Before we enter the Magic Forrest here is (a rather ugly looking) reminder there is no biking on the off road dirt trails. Your journey is about to begin- do you have the ring? Take the trail to the right on your way up. This is a storybook like environment with little arched wooden bridges, river rock walls, caves and more. There's even a group of actors that come twice a month dressed as trolls and fairies to entertain children. You won't find anyone on the trail searching for a magic ring but plenty are looking very diligently for a small bald headed gold man named Oscar no doubt. About 3/4 of the way up the trail is this tree off to the left. It slopes away from the trail and is easy to climb (you can practically walk up it like stairs) so occasionally I will hang out there for a spell - give it a go if you dare. Dogs are allowed on these trails. You'll see all kinds of dogs on the trails from huge beasts to tiny little toy dogs making the climb. I admit I do get a kick out of seeing the pocket sized ones going for it. Right before you get to the top of the loop is a short cut which I call the goat trail that looks more difficult than it is. For a non-rock climber it may be intimidating but I find it is easier and less work to walk up then to take the longer route up the trail. The rocks make for interesting and easy to follow steps and before you know it you are at the top - try it and see for yourself. Just past the short cut/goat trail you'll be at the top of the loop. You can turn around and go back the way you came or continue around the loop and then down returning to where you started or continue up the trail to your right which will take you all the way to the observatory and the great views of the city. Since I was a bit out of hiking shape and pressed for time this was as far as I went today. I call this place an epicenter because alot of activity ( at least a 8.0 on the bicycle Richter Scale) that benefits the local bicycle community emanates from this place beginning with the fact that I bought my bike here which was followed by much riding and then this blog. "We try to help customers as much as possible, answer any questions they may have about their bike or cycling. People are always welcome to just come in and talk about their cycling needs." road bikes, fixies. hybrids, youth bikes. 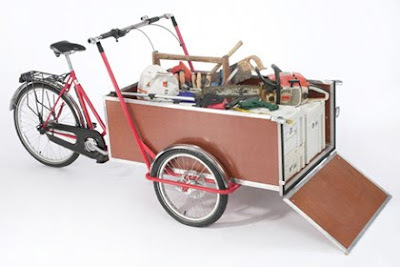 bmx freestyle, mountain bikes, beach cruisers, folding bikes etc. If you purchase a bike from them see free tune up policy below. The shop carries a wide selection of replacement parts including a large selection of rims, tires and tubes. Bicycle repairs here are fast and excellent! There is always 2- 3 repairman available for repairs 7 days a week. "We can pretty much handle anyone who comes through the door with a bike problem to solve though repairs are on a first come first serve basis " says mechanic Diego. Diego also said " alot of bike repair shops won't work on cheap bikes but we'll work on anything" While I was there waiting on my bike a blond woman with an attractive English accent commented that they always bring their bikes there for repairs as the work is excellent. On a previous trip I observed a woman's surprise after she asked how much she owed them when she was told there was no charge for her adjustment as she had originally purchased her bike there. I Have had my brakes and wheels tuned up three times since I bought my bike here and this deal is unbeatable! Bicycle mechanic Diego works on straightening out my rim by observing how the wheel spins and then tightening or loosening the spokes. The first time I brought my bike in complaining about the wheel alignment he explained that potholes or jumping curbs can cause the rim to become crooked. He fixed it and since then I make every effort to to avoid potholes and stopped jumping curbs as well. Some cool looking "Fixies" belonging to locals parked out back of the shop. Cool form of bike art! Saw this bike parked out back of the shop and got to get the skinny on these spoke cards I have been noticing on some bikes. These spoke cards are sold for a dollar as souvenirs of the group rides that take place all over town. They're road worthy as the are laminated and therefor waterproof. They're collected like baseball cards used to be back in the day. Some of the rides have several hundred riders or more and so the organizers can cover their expences and have a few bucks left over - sweet! New handlebars and shoulder bag = satisfied customer! This is a great time (8am) to be riding down Sunset Blvd! Traffic is light and the drivers seem very bike friendly. There is plenty of room to the right and very few parked cars so it's like you have your own bike lane. I pretty much ride the street the whole way. I have my large basket up front and usually take a couriers bag to accommodate all my purchases. Located on Ivar Ave. between Sunset and Hollywood Blvds. arts, crafts, clothes, street musicians, prepared food, drinks. and of course a balloon guy. All items are grown or made by the seller. Early Sunday morning bike traffic on Sunset Blvd. Pre -bike I used to drive around sometimes for fifteen minutes looking for a parking spot to avoid paying for parking. Note: It's only five minutes by car and only ten minutes to ride my bike to the Farmer's Mkt. Sometimes I would luck out and find free parking, sometimes I would just drive back home not wanting to pay for parking. I also had a gym membership across the street so pre-bike I would drive to the gym ( $ parking only $2.00) do my workout ( inc. stationary bike) then go across the street to the mkt. to save three bucks. Wearing the "hat" of writer/blogger now I got an entirely different view of being there with a bike. Walking my bike (no riding please) I observed that a Farmers Mkt. is primarily a walkers paradise. This is a safe haven free from the nasty automobile, where one can slow down and casually stroll about delicious step by step. I sense a feeling of satisfaction amongst people of the fact that they are walking not driving. Here the foot is king and a car with wheels would be considered more of an evil Godzilla like enemy to be quickly attacked with organic matter and subdued. 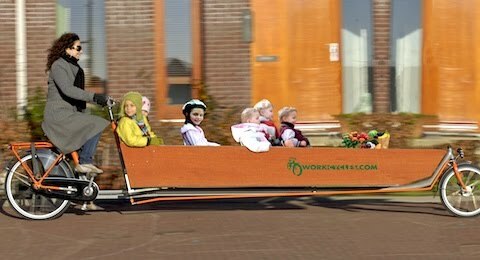 Some things being pulled along on wheels are acceptable though: carts are observed and noted by one and all as to practicality of function along with content while strollers laden with beautiful little people bring smiles, sighs and waves of admiration. This magical atmosphere of growing things and recently planted and growd' little people inspires some I'm sure, perhaps women pulling their carts full of veggies make a wish that someday they'll do some of their own growing and have more then just vegetables in their cart all the while keeping an eye out for suitable mates and growing partners. Bikes are welcome and if they are good looking you'll get some smiles and sighs to be sure but they are not nearly as welcomed I think as their smaller cousins as they look to be more related to the larger Godzillaesque car. I enjoy wheeling my bike around and even if there was valet bike parking such as at the Santa Monica Farmer's Mkt. I think I'd still prefer my near Godzilla like stature. Can't go wrong with fresh sunflower seed sprouts added to your salads!! Above: The quality of the leafy green vegetables is excellent! This large basket is only $ 3.50. There are both organic and "conventional" fruits and veggies and lots of "no spray" ( not certified organic but no pesticides.) Why would anyone buy pesticide laden veggies when the healthier ones are nearly equal in price? I actually think some people are against the concept of organic costing more and stuck in that idea and so ignore the equally priced organic produce when they come across it as a matter of habit. There were a few bikes dotting the landscape early this morning. Spotted this gentleman getting off the bus with his bike on my way home. His name is Pedro and he likes to bus and bike to work. Says he is getting old and likes to get exersize by working up a sweat riding to work then change into his uniform there. 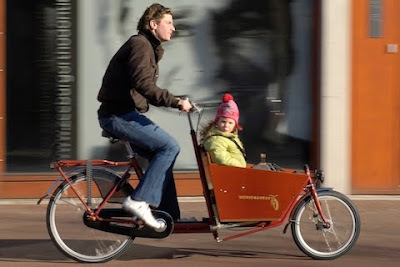 This blog has to do with the future what it should look like on our streets - with Cargo bikes. They are very much in use in Europe and are starting to gain popularity here in the US and are now being manufactured here. 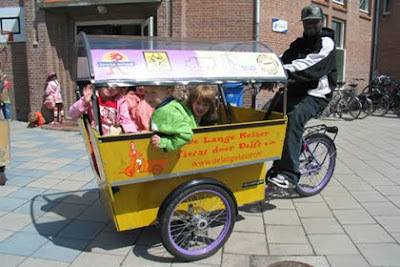 The Europeans don't fool around with these they use then for child transport and small businesses. I would think having the children upfront would be far safer than the usual small trailer behind the bike setup for small children here in the US. It looks like they are having alot more fun riding up front too! Would be nice to see some of these on the streets of Hollywood in the near future.